Discover Bridge's learning management system (LMS) for your business. Includes info on Bridge, free trials, reviews, pricing, and FAQs. 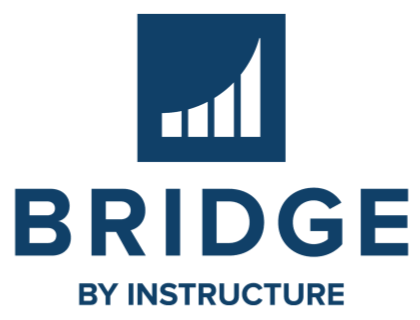 Bridge Learn by Instructure is a cloud-based learning management system (LMS) that empowers businesses to develop their workforce. Bridge Learn is an employee-driven, manager-supported learning system that comprehensively addresses both the learner and author experience within a single solution. Pros: Available for mobile devices. Enables you to develop tailor-made courses and to create customized reports. Cons: Reporting needs some improvement. Bottomline: Enables you to grow your employees and assist them to develop relevant skills. What is Bridge Learn's price range? Bridge Learn's pricing starts between $5,000.00 and $25,000.00 for their one-time implementation fee according to SMBGuide research. Instructure does not provide pricing for Bridge Learn on their website. Bridge Learn costs $9,000.00/500 users annually according to SMBGuide research, and their annual support fee for 500 users starts at $1,700.00. Is there a Bridge Learn free trial? You can access your free Bridge Learn trial at the top right of their homepage. Where can I find the Bridge Learn login? Visit community.bridgeapp.com and log in at the top right of the page. What are some Bridge Learn alternatives? Second Bridge! Instructure offers amazing products.